Well, these “little angels” (I mean chocolate pretzels) are only here for a short time until they go back up to heaven… oops, I mean until January when they disappear for another 11 MONTHS!! What is up with that? I think these pretzels should be allowed to stay year round. These aren’t really snowflakes anyway. They’re stars that are dressed up with cute little white sprinkles to look like a snowflake. The last time I checked, the stars come out every night – not just for the month of December. Love, love, love these pretzels. 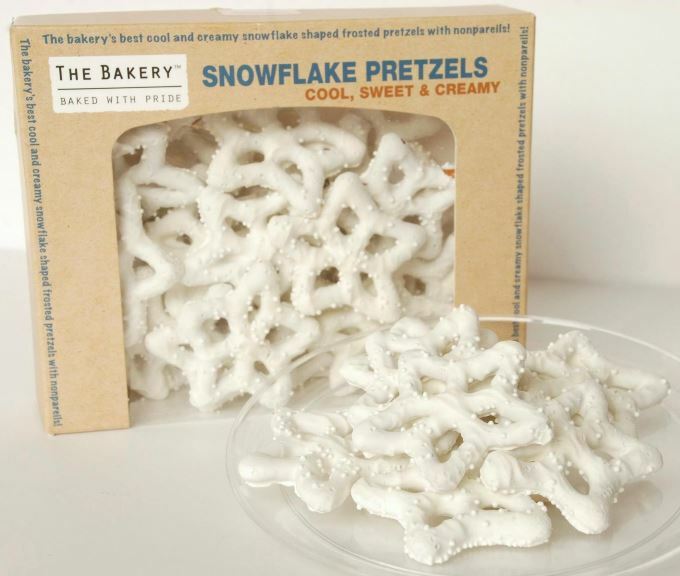 This tiny container of snowflake pretzels just isn’t big enough. It needs a bigger box. Because when you eat one, you want more, a lot more. Then your kids want to try them and you’re out. So, this is basically my portion. I’d recommend buying more than one box if you feel like you HAVE to share. But seriously, they are heavenly. The sprinkles give an already tasty pretzel an extra sweet crunch. The white chocolate coating is perfect. Pretzels dipped in white chocolate – life just doesn’t get any better. I’ve had yogurt coated. I’ve had almond bark coated. Those aren’t even in the same class. STARS I tell you. Stars that should come out every month. 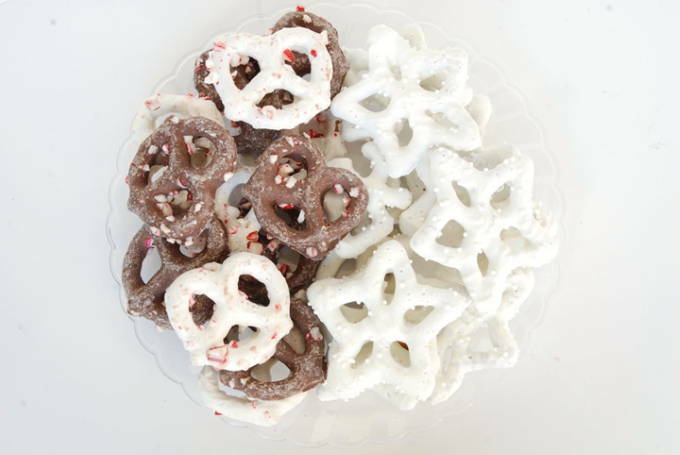 The taste of these peppermint pretzels delivers. They have peppermint chips instead of white sprinkles. They’re oh so good. 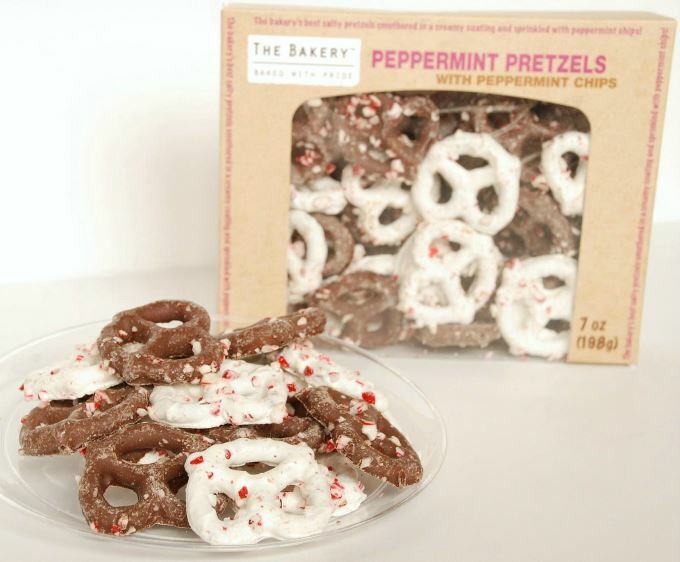 Love the minty crunch of the peppermints with the chocolate and pretzels. The milk chocolate reminded us of my peppermint hot cocoa recipe. I’m a white chocolate fiend so I’d prefer the whole box was white. But rest assured, I’m happy to polish off both kinds. We found these holiday sweets at our Neighborhood Market™. I’m crossing my fingers that your Walmart carries them. 30!! You’re outbuying me! I was tickled to hear someone else loved them as much as me. I had no idea they’ve been out since before Thanksgiving. I’ll be on the hunt early next year. Thanks for taking the time to write the very first comment.